In October 1861 it became known in Perth that the [20th] company would return to England, without replacement. During this year more of the sappers took their discharge in the colony on the expiration of their engagements, and when the company departed …….. it numbered thirty-seven men (1). Coincidentally, the only two records I had to start with for William East were dated in that very year – 1861. Each led me to reconcile the Muster Rolls and Pay Lists I had available. Was Sapper East in Western Australia in December 1857; the answer was NO. But was he among the arrivals on the Nile in January 1858; the answer was YES. In December 1857 the record shows a total of 52 privates; in January 1858 it shows an increase of 27 men. The overall 20th Company complement in WA from New Year’s Day 1858 was now one colour sergeant, five sergeants, four corporals, six second corporals and 78 privates for a total of 94 men. Thus William East was one of the 27 men who arrived on the Nile. Was he married? Did he have children? The birth, marriage and death records of Western Australia were silent on this point. When did William enlist? No Army service records are extant for him, thus making his age and origin impossible to determine. A trawl through census records produced hundreds of men named William East, indistinguishable from each other or unsuitable by other criteria, despite keyword filtering on sapper’, ‘private’, soldier’, ‘pensioner’, ‘blacksmith’ and ‘smith’. One other possibility for background on this man is from a Royal Sappers & Miners Muster in 1841 where a William East (no service number) is recorded with the 5th Company at Chatham, Kent (8). 01 Jan 1858 – Arrival of William East, Smith (2). 01 Feb 1860 – Promoted to 2nd Corporal (3). 29 Jun 1860 – Entitled to Good Conduct Pay (4). 11 Feb 1861 – Instructing Warder at York (5). 26 Feb to 13 May 1861 – Temporarily in charge of York Depot (5). 31 Oct 1861 – Promoted to Corporal attached to 32nd Company (6). 01 Apr to 30 Jun 1862 – On WA Pay List attached to 32nd Company (7). Of course William appears on all the musters in between Jan 1858 and Jun 1862, but those available are completely silent about where he was working and what he was doing. It begs the question, on what ship did William East leave Western Australia? 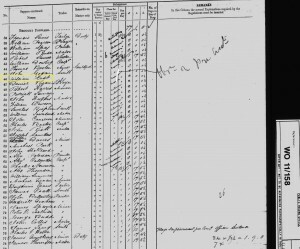 Did he return to England on the Lincelles in April 1862? And where was the 32nd Company stationed? (1) The Colonial Engineers: the first volume of the history of the Royal Australian Engineers written by Major General R R McNicoll, CBE, 1977. (2) Muster Rolls & Pay Lists January 1858 [WO11-158]. (3) Muster Rolls & Pay Lists Apr to Jun 1860 [WO11-175]. (4) Muster Rolls & Pay Lists Jan to Mar 1861 [WO11-187]. (5) Warders and GaolersDictionary, David J. Barker p. 64. (6) Muster Rolls & Pay Lists Oct to Dec 1861 [WO11-199]. (7) Muster Rolls & Pay Lists Apr to Jun 1862 [WO11-207]. (8) Muster Roll (Index Only) 1841 [WO11-91].